Photo by Jay W. Bennett Parkersburg South’s Braxton Amos, pictured here earlier this January working toward a first-period pin of Mason’s Jake Arengo, was named the 35th recipient of the Robert Dutton Award Sunday by a state wide panel. 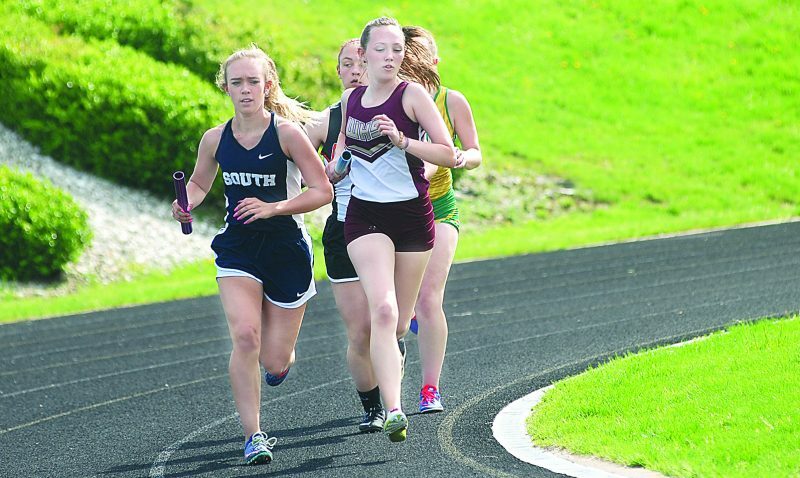 PARKERSBURG — Olympic aspirations naturally elevate athletes onto higher planes of performance. Limits are pushed and boundaries broken on one’s rise to an elite existence. 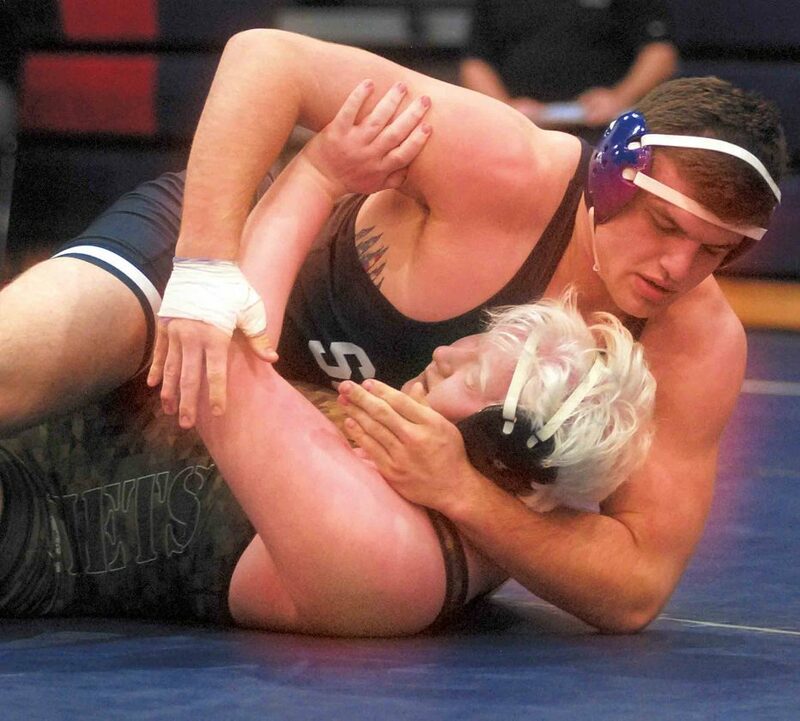 If you multiply this factor by Parkersburg South 220-pound wrestler Braxton Amos’ talent and insatiable will to succeed one gets a transcendent entity. The Patriot ascended to the nation’s top spot in his weight class, according to TrackWrestling.com and Intermat, before the beginning of the 2018-19 season thanks to a product of these factors. 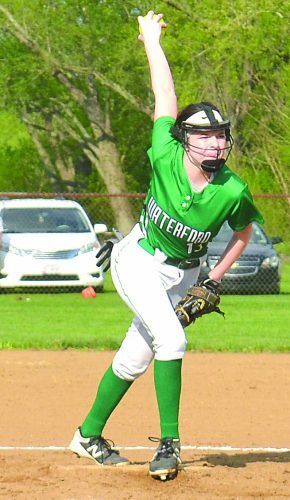 A freshly bulldozed path of destruction through West Virginia’s Class AAA en route to a second straight offensively un-scored upon and undefeated season along with an individual state title proved the ranking correct. 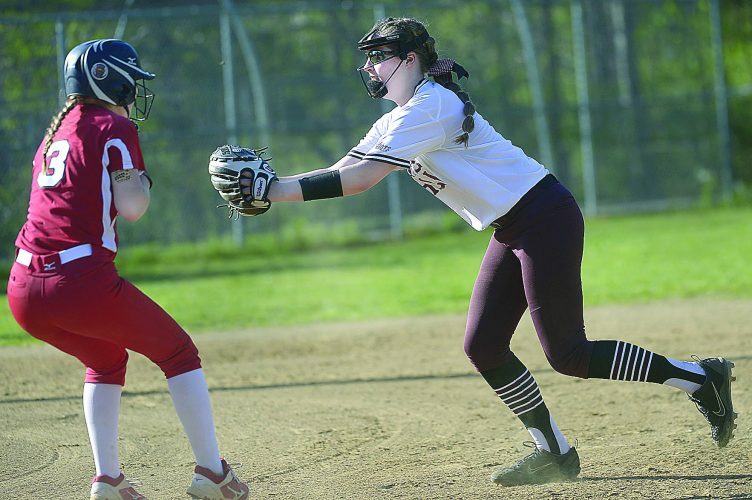 Back-to-back championships in the Walsh Jesuit Ironman Tournament and Powerade Tournament, two of the most prestigious high school events in the country, were added for good measure. His coronation as the most outstanding wrestler at the state tournament inside the Big Sandy Superstore Arena in Huntington being the cherry on top of his sundae so he thought. The junior’s trajectory propelled him into elite territory today thanks to his dominant reign in the Mountain State. Amos was selected by a statewide panel as the first underclassmen recipient of the Robert Dutton Award given annually to the best wrestler in the state. Make no mistake, dominance well describes his past season. Matches ended in pins, major decisions, or not close if his opponent wrestled him at all. Wheeling Park’s Dylan Wood was the only grappler capable of a full three rounds with Amos. Wood still lost in an Ohio Valley Athletic Conference final in a 12-4 major decision and was pinned in the 220-pound state finals. 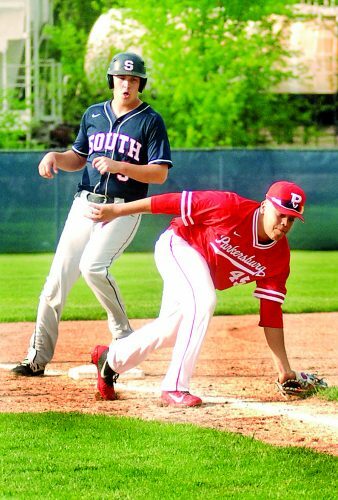 Parkersburg South head coach Shaun Smith lacked surprise when asked about his team member’s achievement. “He is an individual always striving for more and for him to get this award especially as an underclassman if anyone was going to do it, he was a good candidate,” said Smith. With the win, Amos achieved a standard he set before discovery of the world trials and the Olympics. South’s wrestling program welcomed standout wrestlers in the years before Amos joined the program. Preparation for his dominance on the mat begins in practice. Nothing better exists in his mind than preparing for his opponent with certain moves then pulling off said moves in the actual match. The fact wrestling opportunities still exist impresses in itself. Amos missed his entire freshman year with a torn ACL. His patience through rehab paid off. Out of the five injuries West Virginia University Medicine’s orthopedic surgeon Dr. Barry McDonough treated at the same time, Amos’ alone has not been torn up again. Oak Glen’s 138-pound junior Peyton Hall, who capped off his junior campaign with a 43-3 record and his third Class AA/A state title, finished runner-up. Fairmont Senior junior Zach Frazier, who also went undefeated and claimed his third straight Class AA/A heavyweight title, finished third. 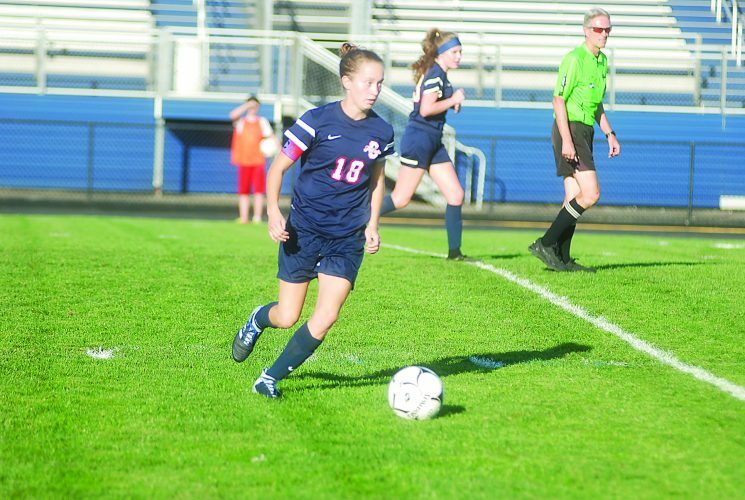 It was the first time the top vote getters were underclassmen. Amos is now the fifth Patriot grappler to win the award, joining ex-teammate and last year’s winner Josh Humphreys along with Chad Porter (2006), Jason Johnson (1998) and the inaugural Robert Dutton Award winner Dave Miller (1985). He will be presented his trophy as the 35th recipient during the 73rd annual Victory Awards Dinner, which will take place on May 5 at the Embassy Suites in Charleston. The Robert Dutton Award is sponsored by The Parkersburg News and Sentinel. It’s named in honor of legendary Parkersburg High School mat coach Robert Dutton, who guided the Big Reds from 1957-76 and is a charter member of the W.Va. Chapter of the National Wrestling Hall of Fame.